Northern Irish landscape photographer, specialising in the Causeway Coast, the Mourne Mountains and Belfast. I am a dedicated aurora photographer and love chasing the northern lights all across Northern Ireland. I specialise in shooting panoramic shots too. I think Thor must have had something to do with it. Not, you understand, the Norse god of thunder, but the Chris Hemsworth variety. How? Let me explain. The afternoon before my first aurora shot on 30 October 2013 had been a typical autumnal day on the north coast with rain and grey skies. So, to fill the time, we took our kids to a late afternoon showing of Thor 2 in the cinema in Coleraine. Afterwards, whilst sitting in McDonald's having a bite to eat, I noticed the Scottish members of the Aurora UK group in Facebook starting to buzz with excitement at some auroral activity making an appearance in their more northerly latitudes. "Look at these photos," I said to my wife, nonchalantly. "Do you fancy swinging around past Dunluce Castle, just in case?" "Sure, why not?" she said, matter of factly. And the rest was history. 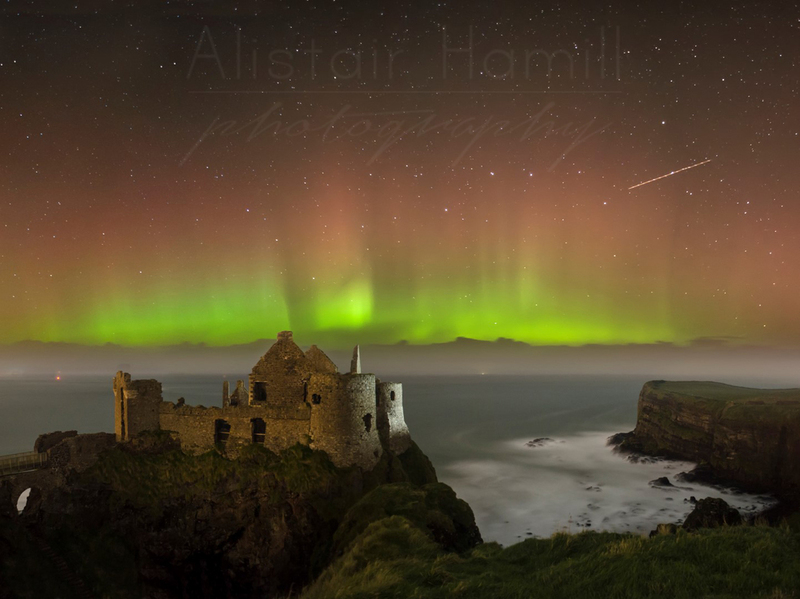 The 30 October norther lights at Dunluce Castle - my first aurora shot. Fast forward to the week beginning 24 February 2014. Top of the new Blu-Ray releases that week was - you guessed it - Thor 2. Being such sci-fi geeks in our family, I bought the movie on the day of release and presented it as a wee gift to the family. And I happened to say to them how I'll always associate that movie with that wonderful aurora-filled night in October 2013. Little did I know that, a mere four nights later, I was going to be treated to an even greater aurora display, probable the best over the UK in 20 years. So, fast forward to Thursday 27 February. It was a night like many others, full of the busyness of family routine. I was due to attend my daughter's Parents' Night and, as we set off for it after tea, I noticed how unusually clear the night skies were. "I'll maybe pop out later for a few star shots," I thought to myself, totally oblivious to the display that had already begun to make its presence felt northwards. We were sitting in a queue in the school waiting to see yet another teacher when, without even really thinking about it, I pulled my phone out and checked Aurora UK. It was going mad! 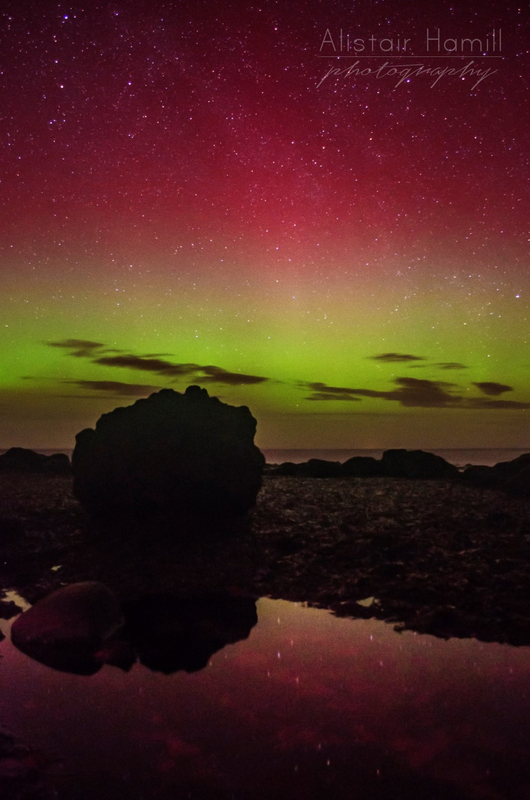 Reports of stunning displays covering half the night sky in the Shetlands; overhead auroras in northern Scotland. If it was doing that in the north, that meant that N Ireland had a really good chance of seeing some activity - and I was stuck in a queue in a parents' night! Nevertheless, I started posting on Facebook about it and before long some reports came in of sightings on the north coast! I texted my mate Alistair White to see if he fancied heading north and so it was around 9.40pm, when I'd got home and got my gear together that we started the dash for the north coast. Would we make it in time? We would soon find out. Our route north took us along the magnificent Colin Road north of Ballyclare, a route that offers sublime views across the valley to Slemish Mountain to the north east. And as we drove up this road, we got our first taste of just how incredible a show this display was. "I think I can see the aurora!" 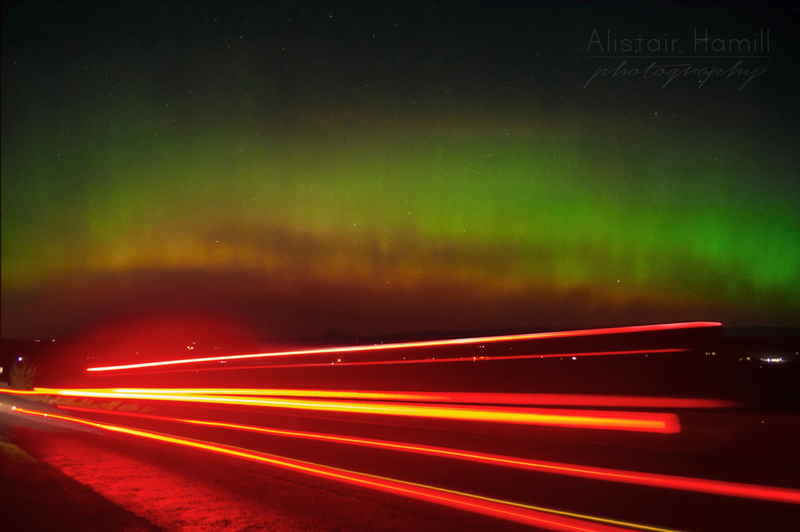 I said to Alistair, even though we were driving along and with all the light pollution coming from the dash board. He looked and saw it too - we were giddy with excitement! A phone shot of my first auror shot at the Colin Road. This was only a two second exposure - the aurora was that bright! "We've got to pull over and grab a shot here!" I said. Alistair was sceptical - he, understandably wanted to head north as fast as possible. "Just five minutes, that's all. If we got north it had gone, we'd be kicking ourselves!" So we stopped. And we were treated to that most sublime of night time light shows, as a distinct band of green light shimmered in a band across the sky to the north, complete with dancing verticals of red beams. And all so distinctly visible to the naked eye. My excitement was palpable as I set up my camera as quickly as possible. My first shot was a mere two second exposure, and still the lights burned brightly off the back of my screen. Last October had shown me that it was possible to see the aurora from the north coast of N Ireland. And I had heard stories of people seeing it as far south as Ballymena in decades gone by. But never did I think I was see such a display so clearly a mere couple of miles from where I live. 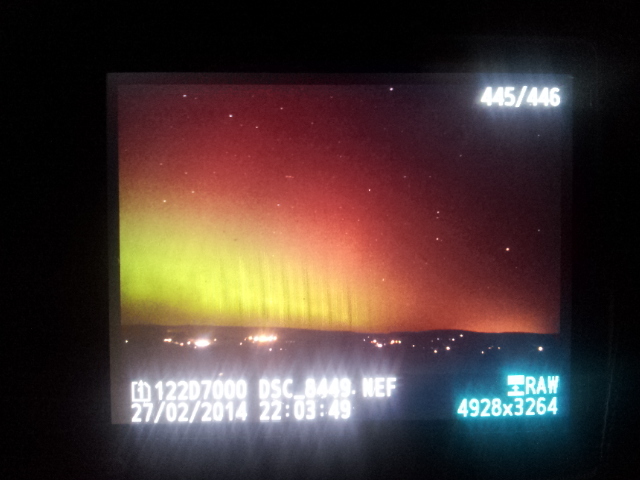 The most spectacular of auroral displays at the Colin Road, Ballyclare. We grabbed a few shots, keen to be on our way north, and I think I might have gushed just a little bit on my Facebook page, keen to let other people know what an amazing display was underway. During the journey north, we kept peering out the car window to see if the action was still taking place - and it was! In some ways the journey was frustratingly slow - we just wanted to be there photographing - in some ways it flew by, buzzing as we were after our shots at the Colin Road. We'd decided the Giant's Causeway was going to be our location of choice for the show and as we arrived down at the stones, I've never seen as many cars in the little turning circle. Word had, understandably, got out. I got out of the car and looked up - as my eyes adjusted to the darkness, I realised just how much of a light show was still going on. Not quite as strong as the one we had seen around 10pm on the Colin Road, but still fully visible to the naked eye and stretching wide across the horizon. We had made it! We rushed down onto the stones in the moonless darkness and joined a band or about half a dozen other photographers, all looking for that perfect composition to act as that perfect foreground for the light show. And, seeing as we were at the world class Giant's Causeway, this was far from hard to do! The light was still so strong from the emerald band that the light reflecting on the stones and off the surface of the sea was green! As I am a fan of multi-shot panoramas, I took various shots at various locations on the stones. 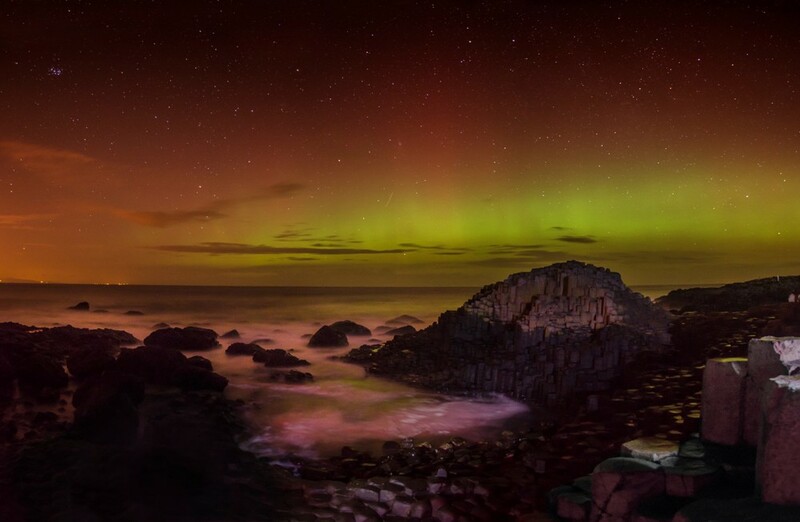 A four vertical-shot stitched panoramic of the aurora at the Giant's Causeway. Even with only a half a dozen of us, there was still a fair amount of light pollution going on between people using their torches to navigate their way across the stones or to light paint the foreground. At one point, our shadows were cast across the sea surface by someone higher up on the stones themselves. After shooting on the stones for a while, we heading to the other side of the Causeway. Just after we arrived there, another minor spike occurred and some faint vertical spikes of purple-red made an appearance. 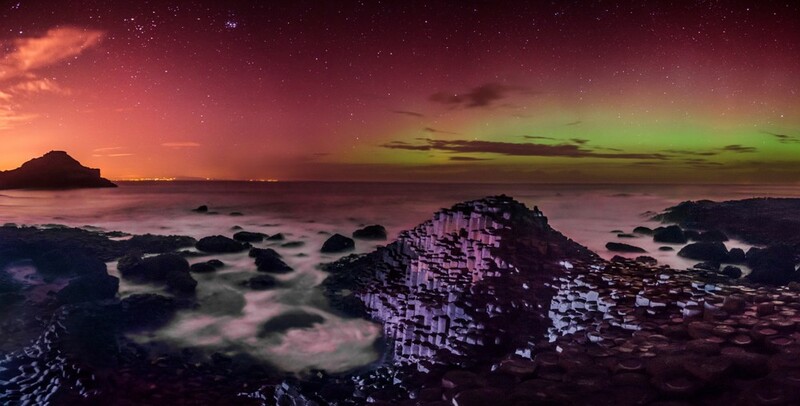 That famous Causeway headland bathed in a glorious auroral display. I fancied getting a reflection of the display in some water. The sea had reflected a greenish tinge, but it was moving too much to offer and kind of proper reflective surface. But I thought I'd spotted a rock pool in the darkness close to the water. Cue what I'm sure was some pretty comedic scrambling over the rocks in the darkness, stepping in some smaller puddles on the way and slipping on some unseen seaweed as I made my way to the rockpool. But I think it was worth it all! At around 1am, with an hour's drive home and work the next day looming, we decided to call it a night. One or two final shots, and we packed up and headed home, still buzzing with excitement, looking forward to the chance to get procesing the photos we took, and so pleased we were able to witness what was probably the best auroral display in the UK in decades. The next morning we awoke to news of sightings as far south as south Wales and Essex. There were some stunning overhead shots of the lights from northern Scotland and some people in the most northern extremes of the UK even had to turn their cameras south to witness the show! Each of us has our stories of that night - I'm glad mine is one of them! So I'm not sure if Chris Hemsworth's Thor had anything to do with it at all, but I tell you what - when Thor 3 comes out, guess which direction I'll be looking in the night's sky when I come out of the cinema.